In the past week I have received at least 3 calls from my foreign friends asking help to find decent costume rental in Prague. Last year I have visited few of them and here is an overview what you can expect. Don’t forget to reserve your costume on-time, because Czechs hold many fancy-dress parties for kids over winter as well as fancy dress parties and balls for adults. If you wish to purchase a kids costume - you will find quite a good choice in Tesco, Bambule Toy Shops, Sparkies and even NEXT. This is probably one of the best costume rentals I’ve visited, it’s mainly for Adults. 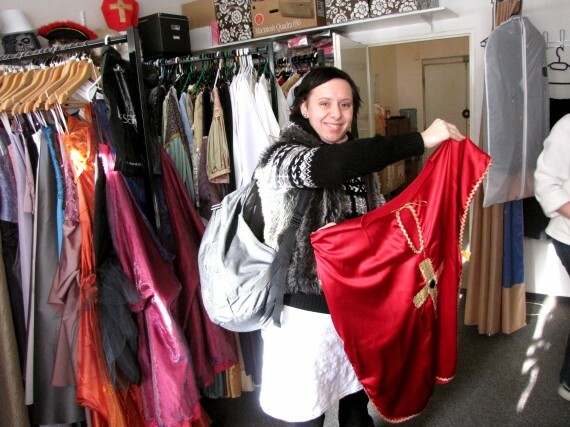 The owner, Vera, creates all of the costumes herself and they are all very nice. She has Mens, Ladies and Kids costumes. She doesn’t speak English and I advise you to go there with a translator or at least list in Czech your wishes. You will choose your Costume and book it for certain days. You will have to pay a deposit on the spot around 500czk and you will come back to pick up the costume when you need it. You will need to present some ID. No need to have it dry-cleaned - she does it herself and it is included in the price. You will be also asked to leave a deposit that will be reimbursed to you when you return the costume - usually 750 to 1000czk. She also makes costumes and made-to-measure bridesmaids dresses. You can also rent a gown (ball dress) as well as tuxedo here. Remember to have CASH on you. No Cards are accepted. Its possible to set up another time over the phone. This is a costume rental where I borrowed costumes for the whole of our family and bought few wigs. I was very happy with the choice and with the service. They have a good choice of adult and kids costumes. I mean - for Prague. If you are an American - you would find it poorly :-) because America is full of awesome costumes everywhere. Just to explain. This Rental is a bit hard to find. It’s on the top floor (2.nd) of the Shopping Point shopping centre in Repy - Prague 5 - forsome reason they say Prague 6 - Repy - but its more Prague 5. It is a very Czech district - with just a few foreigners. You have the rely only on yourself - do not expect anybody to speak English here. yet again - the owner is nice and will do the best to help you out. Only in Czech thought. Same system here as at Vera Black. You choose - prepay a certain deposit - pick up your costumes on the agreed date, if it happens to be for weekend function - you are charged just for one day rental and you have to return it on the following Monday. Adult costumes costs between 490 to 590czk to rent for 3 days, Kids costumes 250 to 390czk. Depending on the value of the costume. All the rest of the listed Costume rentals I have not personally visited, I only know them from the web. You might like share with us your experiences with these firms so we all have this information for future reference. Have fun dressing up yourself or your kids this season! Here you can reserve your costume on-line as well. What a great idea. Prices of the costumes are usually between 250 to 600czk. In addition they take a deposit of 750czk for each costume, which is fully refundable when the costume is returned back in its original shape. They also rent costumes for Santa Claus and Mrs Claus, costumes for St. Patrick’s day or costumes for Octoberfest. OPEN: Mo, Wed, Thur 9:00 - 18:00 Tue, Fri 12:00 - 16:30 hod. The owner is an artist who creates all her costumes. She will produce any costume made to measure but you can also choose from a wide choice of pre-made costumes. She also organises kids birthday parties and makes puppets. If I lived in Vinohrady - I would not hesitate to visit her. Not sure how her English is. You can also purchase any costumes in the studio. This is more like film studio costume rental. They do it all including Mascot costumes. They have around 2000 ready made costumes which is A LOT! (Other rental places promise around 300 costumes). They also produce any kid of costume that you need. However - I didn’t find any Kids costumes on their website. You would have to check if they had any or not.